Printed in: Friends Journal, Friends Publishing Corporation, Philadelphia, PA, November 2009. Nine years ago, my father and I drove from our home in Philadelphia to the 2000 Friends General Conference Gathering in Rochester, N.Y. It was our first Gathering. I was a shy ten-year-old and don’t remember much from the week. I do recall that both my father and I were very impressed by the community. He is not here to correct me, but I think my father felt that the community was a place where his son could grow and thrive. He was right! At the time – nine years ago – Philadelphia Yearly Meeting (PhlYM) was holding biannual summer sessions in Allentown, Pa. As we had enjoyed ourselves so much at the Gathering in Rochester, my father decided to take us to the Gathering on years when PhlYM was not holding summer sessions. When we had another fabulous experience at the 2002 Gathering, it was clear that we had to go every year. I haven’t missed one since. As the years went on, I grew to look forward to the Gathering – a symbol of summer’s beginning. My father and I would arrive on college campuses, greet people with big hugs, and instantly develop new friendships. Before I was in the High School Program, I would wonder who was leading my Junior Gathering group and who would be in it. I have great memories of those Gatherings. The summer after fifth grade, Pamela Haines led my Junior Gathering morning workshop. The main thing I remember is how much fun we had. Throughout the week, we created things from elements in nature. We made rainsticks from beans and pieces of bamboo and crafted teepees out of vines. I love nature, and as I carried my creations home, I remembered all the fun we had had during the week. After each Gathering, my father would see that I had changed. My shyness went away. I hung out with my peers – something that I didn’t do much at home – and fully participated in the scheduled program. It made his heart sing. When FGC discovered my father’s talents behind the camera, he was asked to serve as the Gathering photographer. He loved this job. He would walk around campus capturing images of people in action. He would photograph plenary speakers as they were conveying their deepest message – or sometimes their funniest. He would enter workshops and take pictures of participants grappling with some contentious issue. He would catch children playing and high schoolers and young adult Friends wrestling with one another during a game of Wink. In our room at night, we would go through the pictures he had taken that day, separating the good from the bad and talking about his style and goals. He valued my suggestions and critiques, and we valued this time together. At the Gathering, when there is so much going on, you really have to work to find time to spend with your family. Going through pictures was our way. When I entered the High School Program at the 2006 Gathering, it was harder for my father and me to find that precious time together. He would catch me on my way to lunch or after an activity, pull out his laptop, and we would look at pictures. He let me know how much he valued my comments. Sometimes I would be in a hurry and, at first, wish that I could go, but I didn’t – time with my father away from home was special. The 2006 Gathering was held in Tacoma, Wash., and a group of Friends – mostly high schoolers – organized a train ride across the country. People came to Chicago from all over the East Coast and Midwest and climbed aboard Amtrak’s Empire Builder bound for Seattle. (Actually, Amtrak had to bus us from Chicago to Minneapolis/St. Paul because the train left Chicago before the people from the East Coast arrived.) I will always remember that trip to Gathering. For me, the High School Program and the train ride across the country were continuations of the tight community my father and I were drawn to at our first Gathering in Rochester. As the country unfolded before my eyes on the Empire Builder, I bonded with the other Quakers on the train. At the Gathering, the high schoolers stayed in a dorm separate from our parents. We felt connected as a group and with the wider Gathering community, participating in intergenerational workshops and conducting our own meetings for business. It was at the 2006 Gathering that I first heard of the Woolman Semester, a Quaker program in the foothills of the Sierra Nevada Mountains where students incorporate issues of peace, social justice, and environmental sustainability into one semester of high school. I was in awe of the program and what the school had to offer, but I never dreamed that I would attend. I had only finished ninth grade, and I had no intention of leaving home before college. I never imagined that three-and-a-half years later, I would be on a plane bound for the West Coast. It was that same year that I was nominated to be one of the high school clerks for the next Gathering. (Clerk nomination in the High School Program at Gathering is different from traditional Quaker nomination practices. Names are brought forward by the community. Nominees are asked whether they accept, and those who do are then considered by a Discernment Committee. Six Clerks and one alternate are discerned.) When I accepted my nomination, I did so with the expectation that I would not be discerned. I was. 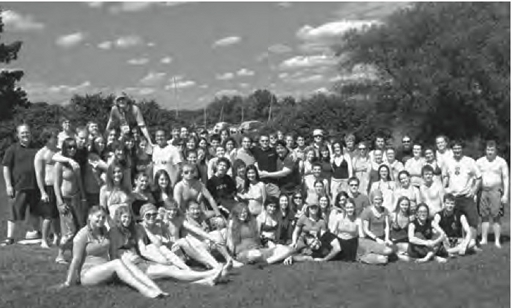 That November, the 2007 FGC high school clerks attended Arthur Larrabee’s clerking workshop at Pendle Hill. During the weekend, we formed a tight group and decided who would do what at Gathering. I agreed to co-clerk the High School Program’s Nurturing Committee. I had only clerked once before, and I was excited for the experience. The 2007 Gathering was in River Falls, Wis., and my father and I traveled there by train. We had always dreamed of taking a long-distance train ride together but had never done it. (He did not come to the Gathering in Tacoma by train.) I still remember getting on at 30th Street Station in Philadelphia, changing trains at Penn Station in New York City, and winding our way up the Hudson River and through upstate New York to Union Station in Chicago. This time, we did get there before the Empire Builder left. It was a great trip. We got on each other’s nerves occasionally, but that is part of being family. At the Gathering, I had even less time to look at pictures with my father due to my clerking responsibilities. He understood, but he would catch me if he saw me with a free moment. I loved his photographs, and being together filled us both with joy. At the high school business meeting that year, I again heard about the Woolman Semester. It again piqued my interest, but I never expected that I would attend. California is far away from my home in Philadelphia. On the last night of the Gathering, there is no curfew for the high schoolers, and many stay up the whole night – including me that year. The next morning, we had to leave campus at 6:30 AM to get to the train station in time. My father was never an early riser, and I was relieved when I saw him arrive before the shuttle had to leave. We were both tired and a little cranky, but after we boarded the train and got a few hours of sleep, everything was fine. He pulled out his laptop, and we looked at the photographs he had taken during the week. As the country rolled by, I helped him edit and sort them in preparation for when he would submit them to FGC. This was a special moment in my life. I was reminded of the Woolman Semester twice more that summer: once at a college fair, and again when my mother and I were visiting friends in Nova Scotia. One of our friends – a non-Quaker – asked me if I’d ever heard of Woolman. I said that I had. Knowing that I was into peace and social justice, he encouraged me to consider attending. It was then that I realized Woolman was “knocking at my door,” and I had to let it in. After a lengthy application process, I was accepted into the Spring 2009 Woolman Semester. My father and I were planning to take the train to the 2008 Gathering in Johnstown, Pa., but he had some health problems that got in the way. I went out myself, and he came a day later. By then, it was pretty clear that I was going to go to Woolman the next spring. I listened to the announcement at the high school business meeting with new ears. Memories of the night when I first heard of Woolman flooded my mind. How young I had been in 2006 to think that this program was beyond my reach. My father was not the official photographer at the 2008 Gathering, but he couldn’t leave his camera home. He did not take as many pictures – hundreds rather than thousands – but on the train ride back, he pulled out his laptop to show me his work. I had gotten one-and-a-half hours of sleep the night before, so I was a bit less cranky than I had been one year earlier. That ride will also stay in my mind for a long time. I left for the Woolman Semester at the end of January 2009. Both of my parents were at the airport to send me on this four-month journey. Being at Woolman changed my life. To live in a community of people who are making a difference in the world is inspiring. To wake up each morning in a small cabin in the woods and go to class with the knowledge that what you are learning has meaning gives your life purpose. Over spring break, I came back to Philadelphia to connect with friends and family. When it was time to return to Woolman, my father took me to the airport. As we hugged and said how much we loved each other, we did not know that this would be the last time. One month later – one month before my Woolman Semester graduation – my father, Laurence Marc Sigmond, passed away in his sleep. The day before he died, my parents, though they had been divorced for many years, shared with one another how happy they were that I was thriving so. They were and are so proud of me. That will always be in my heart. I was carrying everything I have shared and so much more as I arrived at the 2009 Friends General Conference Gathering in Blacksburg, Va. It was my first time in the Adult Young Friends Program. My workshop promised to be excellent, and I was expecting a week of fun, connection, sadness, and grief. The first day of the Gathering was hard. Though I knew many people in the AYF Program, I missed the tight community of the high school group. I also missed my father. On the second day of the Gathering, AYF formed support groups. In the High School Program, support groups are one of the main ways Friends connect deeply with one another, and I was yearning for that connection. The AYF support group allowed me to begin to grieve the loss of my father and at the same time find the strength to see the joy in being with people I love. That night, I attended the beginning of the high school business meeting to participate in the Woolman Semester announcement. As we described the campus, curriculum, transfer of credits, and program as a whole, I recalled listening to similar words in Tacoma, Wash. In my speech at the Woolman graduation, I said that a seed had been planted inside of me at that business meeting four years ago. Now, I was helping sow seeds for future generations. I went to sleep with a smile on my face that night. Talking about Woolman always brings back so many wonderful memories. During the next few days, I slowly integrated myself into the AYF community. The AYF out-trip was when I really connected with this new group. We spent Monday afternoon at a state park near the Virginia Tech campus. Friends hiked, swam, and just hung out, away from the attractions of the rest of Gathering. It was a good afternoon. I felt in the AYF Program the sense of community that had drawn my father and me to the 2000 Gathering in Rochester. My workshop, Radical Quakerism for Rising Generations, was great. 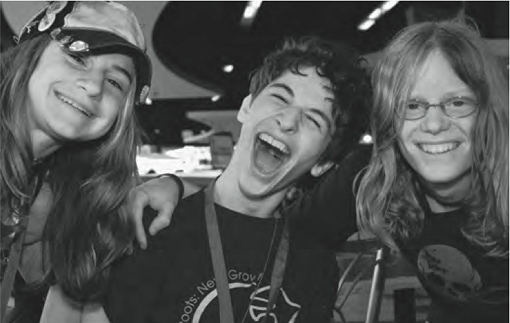 It was led by two of the most enlightened Young Adult Friends I know – Kody Hersh and Peterson Toscano. Throughout the week, we shared what Quakerism means to us and how we view the Bible in our spiritual lives. I was feeling good about the week when the AYF community gathered for support groups on Thursday afternoon. John Watts, the brother of one of my Woolman teachers, was performing at 3:15, and I was going to participate in the Woolman Semester interest group at 4:30. Before we split into our support groups, we gathered in silence and were told that Tom Solenberger, a member of the AYF community, had suffered a serious concussion from a skateboard accident. I was devastated. Tom is a member of my yearly meeting, and I prayed that he would be okay. After more information was shared about Tom’s condition, my support group met. It was good to have that group to be with after receiving such news. I left the group early to hear John Watts perform. His performance and the Woolman Semester interest group were wonderful. At the interest group, former students, parents, and the head of school described the program to prospective parents and answered their questions. It brought joy to my heart. When the Woolman interest group was over, those of us who had graduated from the Spring 2009 Semester walked over to the high school dorm. We had planned to call one of our classmates who was going to come to the Gathering but had a death in the family. As soon as we walked into the building, we knew that something had happened. The High School Nurturing Committee was still meeting and appeared to be in deep worship. Friends were talking quietly in the halls. We were soon told that two High School support groups had seen a cyclist get run over by a dump truck. At the time, no one knew if the victim was a Gathering participant. Friends simply knew that someone had been killed. As I left the High School dorm to go to dinner, my heart filled with emotion. This is not right, I said to myself as I thought of Tom and the cyclist. At the plenary that evening, I listened to Hollister Knowlton’s words with passion. This Friend truly cares about the Earth on which we all live. She spoke so eloquently. I was filled with courage and motivation. This Friend, like me, is empowered to make the world a better place. After Hollister finished her speech and the room returned to worship, the Gathering Committee filed on stage. Bruce Birchard, general secretary of FGC, informed the group in a slow, clear voice that Bonnie Tinker had been killed. The energy in the room fell. People started to sob. I grieved for the loss of Bonnie. Memories of my father were flashing by, and a new level of grief was settling in. I needed support, and I found it by returning to the high school community. I worshiped with them. They held me; I held them. I felt my father’s love, I remembered my time at Woolman, and I worshiped. The next day was Friday. I went to my workshop in the morning. We went around the circle and checked in to see how everyone was doing. Friends were shaken up, but we moved on. It was the last day of the workshop, and we wanted to cover as much as possible. The rest of Gathering passed by. People were in a daze. Meetings for worship were held in memory of Bonnie’s life. Friends prayed for Tom. As we said our goodbyes on Saturday and left for home, there was something new in the air. We were appreciative of the lives we have been given to live and the friends we get to know. When my father and I drove to Rochester, N.Y., nine summers ago to attend the 2000 Gathering of Friends, we saw and felt a very special community, to which we returned year after year. My father gave me the gift of Quakerism. He brought me into the Gathering community. I will always remember him for that, and memories live forever. Carl Sigmond, a member of Germantown Monthly Meeting in Philadelphia, Pa., is a first-year student at Haverford College. This past summer he interned at Friends Journal. 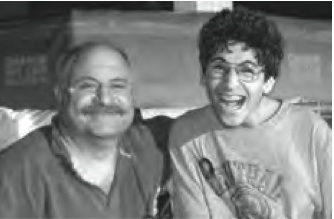 “A Tribute to the Gathering – and to My Father,” published in the November 2009 issue of Friends Journal, © 2009 Friends Publishing Corporation. Reprinted with permission. To subscribe: www.friendsjournal.org.